Imagine a drop of hydrophobic oil on a hydrophilic surface in water. It is not very happy to be in contact with the surface, but it's equally unhappy being in the water. All it takes to tip the balance between surface and water is a surfactant at the surface of the oil so that the head sticks out, offering a more water-compatible surface. There is now a delicate balance between surface and water and with luck the balance allows the drop to separate. A time-lapse video shows the drop gradually rolling-up into a ball and (with or without a last-minute "necking") rising from the surface. This seems easy-enough to understand. But in reality it is a complex process. What is the required balance of surface energies that will allow roll-up to take place? And why does the roll-up start quickly then become very slow up to the last, quick, moments of release? A model in a pair of papers 1, 2 from Prof Kralchevsky's group in Sofia does a great job of describing these phenomena. The roll-up is resisted by a drag coefficient, β, along the line of separation. At any given time, the drop will have a contact radius, rc with the surface and this automatically implies a contact angle α with the surface via the basic geometry of the oil drop (with its fixed volume V) as it tries to rise via buoyancy from the surface. Note that α is the actual (geometric) contact angle of the drop, not the equilibrium contact angle. Because we want drc/dt to be negative (the contact radius decreases with time) clearly we want σOS to be much larger than σWS - in other words, the surface must be hydrophilic. Roll-up cannot take place on a hydrophobic surface!. For a large part of the process, the dynamic, geometry-controlled α will be rather close to the equilibrium angle αeq so the rate of roll-up will be low. If they ever became equal then roll-up would stop. The model below doesn't try to take into account all the parameters - that would be too challenging. Instead it takes one of the representative cases from the Kralchevsky papers and lets you move the slider in linear time from t=0 to t=lift-off. Things happen quickly at the start then are very slow most of the way to the end. The values of drc/dt, rc and α are shown. The value for σOW in this example is ~4mN/m and the equilibrium angle αeq is ~ 35°. As the drop volume is large (0.74 mm³ to make it easier to study carefully) the time-scale for the whole process is >2hrs. The surface in this experiment was glass. Water gradually enters the glass/oil interface via a diffusion process, rendering the glass surface more hydrophilic. If the glass has been pre-treated with acid to make it highly hydrophilic then the roll-up is so fast (σWS - σOS is so large and negative) that it can't be studied in this careful manner. The drop shape is calculated via the Young-Laplace algorithm from the more complex Eötvös roll-up app. There's one remaining problem for roll-up cleaning. What happens to that drop of oil floating around with, perhaps, an indifferent surfactant attached to it? The answer is that with just a little energy it could splat back onto the surface, displacing just a few surfactant molecules as it does. And if the surfactant happens to love attaching its head to the surface then what was previously hydrophilic becomes hydrophobic, positively encouraging the oil to re-deposit. Or the drop could coalesce with another, allowing an even bigger re-deposition back onto the surface. 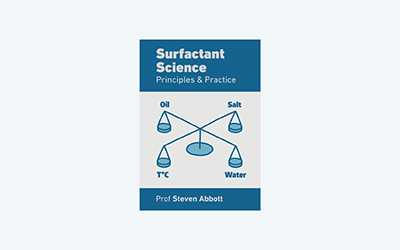 So although strictly speaking just about any surfactant will do an adequate job at roll-up when studied as a nice scientific problem, most surfactants will be (a) poor stabilisers of the drops, (b) poor emulsifiers of the drops, (c) too attracted to the surface or all of the above. In other words, relying on roll-up is a recipe for disaster. Hence a focus on emulsification via HLD=0 or, for real sophisticates, finding "slow" polymeric surfactants that wrap around the rolled-up drop is going to be vital for effective cleaning. However, there is one area where, surely, roll-up is highly successful. Given a generally hydophilic kitchen or glass surface just about any simple surfactant sprayed on and wiped with a cloth is going to do a reasonable job of roll-up - with the rolled-up oil safely transferring to the cloth. If the cloth is microfibre its efficacy is much higher because it can reach much more of the surface. That's why the general household cleaning spray is such a success.